View More In Portable Speakers & Docks - Page 6. 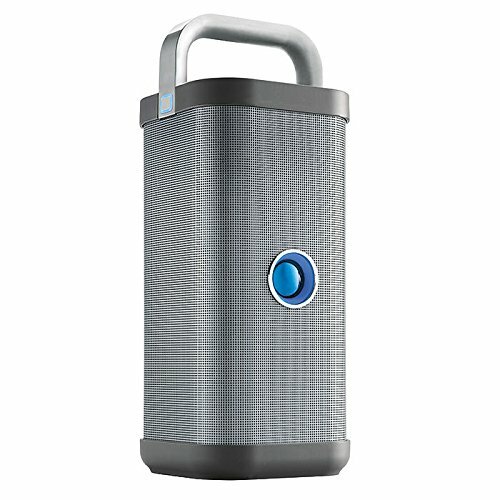 Big Blue Party Indoor-Outdoor Bluetooth Speaker. Massive Sound In Every Corner 4 full-range speaker drivers deliver powerful 360 sound Indoor-Outdoor & Water Resistant Take it anywhere--poolside, decks, or even the beach Easy Bluetooth Pairing Connects wirelessly to Bluetooth devices up to 33' away No Wires, No Cords Rechargeable battery lasts more than 4.5 hours per charge Super Portable Easy-grip carry handle makes it easy to take anywhere Sounds like a party. With its four specially angled speaker drivers, this 72-watt indoor-outdoor speaker surrounds your party in omnidirectional, full-range stereo-complete with thundering bass from the subwoofer and passive radiator. Control it from your device or the top-mounted bass/treble and volume controls. And with a water-resistant exterior, easy-grip carry handle, and a rechargeable battery, you can take your music wherever the fun is. The Story Behind The Big Blue Party Indoor-Outdoor Bluetooth Speaker We already knew how to deliver stereo-quality sound for your home, so we set out to create a way to wrap that same experience in a portable package. This sturdy speaker is a combination of wireless ease, rich sound, and a durable design. It can move seamlessly between indoor and outdoor use, so you can always have music on-hand wherever you are-slope side, poolside, fireside, or in any spot in between. Specifications: 4 speaker drivers, subwoofer and passive radiator Power: 72 watts (18 watts per channel, 36-watt sub) Frequency response: 40Hz-20kHz Dimensions: 6.3"w x 6.3"d x 15.8"h AUX In port DC power port Brookstone A World of Innovation The Bluetooth word mark and logos are registered trademarks owned by Bluetooth SIG, Inc. and any use of such marks by Brookstone is under license.